First off: have you guys seen the new Knitcircus yet? I swear, each issue is better than the last, and it’s not just because I work on them. 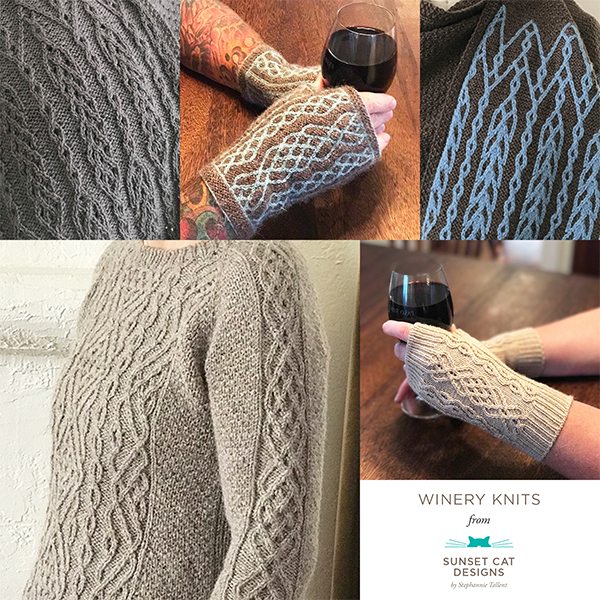 I especially love the Komeeta mitts, the Confection hat (great holiday gift idea I think), French Roast, and the Verona cardi. But all the patterns are fabulous. Second, I promised on twitter to post the recipe for the maple buttermilk bread. I’m thoroughly embarrassed to realize that I did so on the 4th of November, and it’s taken me this long. Regardless, I’ve adapted this recipe from The Bread Lover’s Bread Machine Cookbook by Beth Hensperger. Dump it all into the bread machine (liquids first) & let the machine do its thing! I’ve also been known to add in oatmeal, nuts, etc. Thanks so much to Wendy for her mention of the Wrought Cardi on her podcast, Knit 1, ❤ Too. She’s doing a test of it in gorgeous green Dream in Color Classy. Do you have plans to knit over Thanksgiving? If so, or if you need some ideas, head on over to Ravelry & use the code THANKS to get 25% off my patterns in my Rav store. The code will work beginning today through Monday midnight PST. Support small businesses, buy indie, and so on! Finally…I’m giving away (2) Winter Knitcircus pattern collections. Leave a comment on this blog with your favorite design from the issue by Tuesday night, midnight PST. I’ll post the winners the next day. Good luck! Gratuitous food pic. This is of the quiche I made a couple weeks ago. I started cutting into it before I took the picture, which is why the top looks a bit messy. The second quiche, of which I can’t find the picture, made last week, was even better. They’re too decadent to make more than once every few weeks. Even that often is probably too often! Today I’m going to bake a loaf of bread (in the bread machine, so this is a task that takes less than 10 minutes of my time) and do up a pot of french onion soup. Cut up lots of onions, let them carmelize for, oh, about four hours. Seriously. Doing so makes the best onion soup EVER. Farmer’s market bag of baby greens (the vendor knows we like arugula — “Spicy, right?” and he grabs a big handful of arugula and stuffs it on top), some fresh vinaigrette, voila, dinner. I hope everyone is having a wonderful 4th of July. Franklin Habit has a wonderful post for today (and I have to admit, his comment re: comments made me giggle). We (Dave, me, Rigel) met Tina for a run this morning. So many people out already at 8 a.m., walking their dogs, running, biking, setting up for beach volleyball tournaments. The LA Tri Club 8 a.m. Manhattan Beach ocean swim was on — we could see some people out swimming. It’s June gloom-y, but it was lovely to be out. A little girl in a stroller was thoroughly entranced by Rigel — her mom was fine with Rigel coming up to her for a petting. I love seeing kids who are so excited about dogs, and comfortable with them. We’re planning an otherwise quiet day — grilling some chicken from the Farmer’s Market for a late lunch, potato salad, fresh fruit salad (we got some wonderful nectarines and blueberries yesterday), drinking some pink wine. Knitting-wise, I’m going to try to get Zylphia done to the armholes and one sleeve at least started today. I started a group on Ravelry for my designs. I was a bit worried about doing so — what if no one joined??? But people have, yay! I’m hoping to get some KALs going and to post some techniques links and tutorials there (will have here on the blog as well). Probably the most exciting thing that happened this week was Rigel breaking a window. The squirrel that sometimes sits in our pine tree was there, chittering at Rigel. Rigel got so excited he lunged at the window with both front paws and BROKE THE WINDOW. He didn’t go through it, and he didn’t cut his paws, though he was startled. Dave (with help from me) took out the rest of the broken glass (with the VARMINT chittering at Dave all the while), took apart the window (old aluminum slider window, the fixed window was the broken one, but you have to take out the slider window first to take out the fixed window), and took it to a local glass store. They cut the glass and re-assembled the aluminum frame & gasket around it, and Dave and I reinstalled the windows. Apparently the old glass was thinner than it was supposed to be, which I’m sure contributed to it breaking when hit just so. So…the new window is fine, Rigel is fine, the darned squirrel (which is now referred to by a variety of obscene names) is fine. Dave was fine for the whole process. I was a bit of a basket case. The second most exciting thing…I got a loom! It’s an antique high castle four harness loom. Its previous owner just wanted to find it a home. We’re going to set it up in the cat room (the bedroom/library where the cats stay during the daytime so they don’t use Rigel’s dog door and go outside; they are indoor-only cats). Pics to follow. So….I made soup with some leftover bread (which Dave had made the day before, bread machine — a cliche wedding gift that we really have used over the past 9 (9!!!) years) and the tomatoes. I did choose to add a can of tomato paste. Basically toss everything together. I didn’t measure anything. Not fancy but tasty, and we’ve had it for 2 lunches so far, and have enough for one more. Dave & I & Rigel went running this a.m. I’m really, really wanting to get in the habit of running every other day, no matter how slowly. We did what I consider the ‘normal’ route: parking at the Police Station, running down Pier Ave, then up the Strand (the concrete running/walking/biking path adjacent to the beach) to the ‘steps’ (literally where there are steps that go up from the Hermosa Beach Strand to the Manhattan Beach Strand (which is divided into 2 paths, one nominally for cyclists, the other for walkers/runners)) and back. It’s about a 5k, so it’s a reasonable distance. Dave’s now off for the summer, so we should run together. Pippin got frogged a second time. I’ve nearly finished the second Josephine mitten, a lovely beaded fingerless mitten that should be coming out in the Gifts issue of Knitcircus. I couldn’t bear to touch Pippin again this weekend, and Josephine was on my list of to-do’s, as well as being something absolutely different. I just have the thumb & blocking left to do, then the mitts will be mailed. And….today I received the first packet of yarn from the Sanguine Gryphon — the Eidos for Zylphia and the lace for Emily. I’ve been swatching all afternoon and am delighted to say I’m able to use a US4 for Zylphia (as opposed to a US2 or US3). I’ll be casting on tonight or tomorrow.